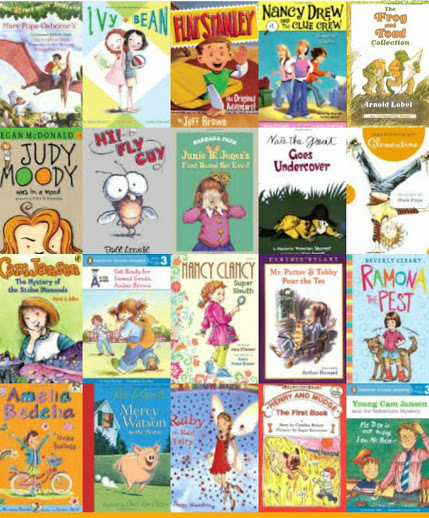 Early Chapter Books are a stepping stone between Easy Readers and Middle Grade novels. These books have more text per page than the Easy Readers and fewer illustrations overall. Some have as few as one illustration per chapter. The distinctions between ECB and ER are blurred and depend on who you talk to. However, the distinction between ECB and MG are much more pronounced. So although you may not be sure if a specific title is an Early Reader or an Easy Chapter Book, you would never confuse it with a Middle Grade novel. Early Chapter Books are read like a novel. They follow one plot from beginning to end (unlike Easy Readers which often tell three to five separate short stories in one book) and are generally divided into ten to fifteen short chapters. The plots of ECB are common themes but with more depth than an Easy Reader. These themes are of a gentler theme than Middle Grade Novels in relation to the maturity of the emerging reader (friendship, school, siblings, sports, mystery etc). The vocabulary of Early Chapter Books is richer and the sentence structure more complex than in the Easy Reader. And there is more descriptive language to paint a picture in the reader’s mind since there is less reliance on illustrations. There is still a certain amount of scaffolding provided in the structure of the Early Chapter Books in addition to the shorter chapters. ECB have a simpler plot and lower total word count than Middle Grade Novels. And like Easy Readers, Early Chapter Books are often part of a series of stories designed to keep the reader coming back for more. Having the same characters, setting, and/or theme allow the ECB reader room to advance within a series with little to no difficulty. Below are some examples of Early Chapter Books.